No Home For The Holidays! My newest release will be available in a few days on December 1, but you can preorder it now! NO HOME FOR THE HOLIDAYS is part of my publisher’s Christmas Extravaganza. It features a variety of novellas in a variety of genres that have Christmas as part of the story. Since they’re novellas that means they’re short–so you can read several of them or all of them this Christmas season. To learn more about the CHRISTMAS EXTRAVAGANZA, go to PELICAN BOOKS. NO HOME FOR THE HOLIDAYS is available now as a PREORDER. Unlike the Prodigal Son, Chloe Sullivan knows she can’t go home for the Christmas holidays or ever—not if she wants to stay alive. To celebrate the release of No Home For The Holidays, five lucky winners will receive a $10 Amazon Gift card. So leave a comment HERE so you’ll be entered to win one of the gift cards. Last day to enter will be December 22 with winners being picked on the 23rd. Just in time for Christmas! Thanksgiving is right around the corner and you know that that means. Then it will officially be the CHRISTMAS season. But as far as I’m concerned it already is. I’m waiting for my husband to start dragging up the Christmas trees. Last year we had twelve. Not sure if we’ll put that many up this year. Anyway a few years ago, THE CHRISTMAS STALKING was released but it’s still a great story to help put you in the Christmas mood. Here’s the prologue that was cut but I still love it so I’m sharing it here. By the way, it’s still one of my very favorite covers. Her hand froze mid-air as she reached for the door knob. Her pulse ramped up. Destiny Martin had always considered herself brave, but she’d been wrong. And that’s how Destiny’s story started. What do you think? Who doesn’t love Christmas music? Right? 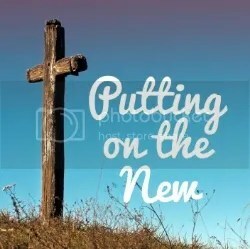 I’m focusing on Christmas music this week at www.PowerUpWithGod.com. Each day until Christmas, I take a look at a Christmas song and it’s message. There’s a music video that accompanies the blog post. So, I’ve got all the days ready to go except for Christmas Day! My question WHAT SONG SHOULD I USE FOR CHRISTMAS DAY??? Any and all ideas would be appreciated. No decorations on these two–just fiber optics and lights. The smaller one plays music! 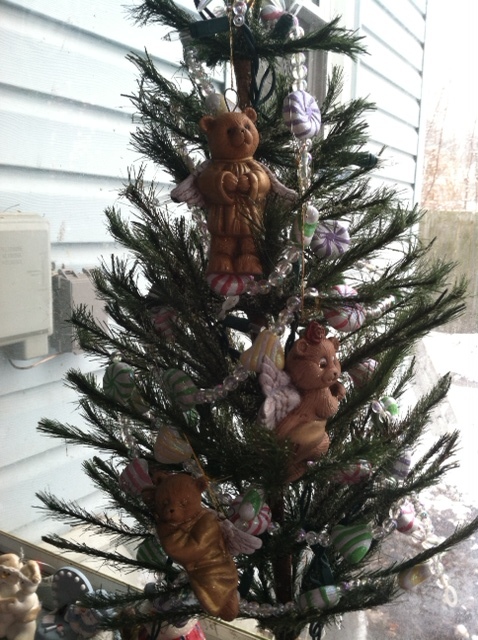 TREE # 5–THE THREE BEARS! Teach us to number our days that we may gain a heart of wisdom. There is nothing like a serious health crisis to teach us to number our days! It started on April Fool’s Day (yes, God does have a sense of humor!) in 2012 and continues still. How it will end? Only God knows. It’s been a long journey for me as well as for my husband. It’s not been easy, but God has taught me much. And one of those nuggets of wisdom is to celebrate life! Celebrate the big things but even more so the little things. Celebrate the mundane, the unusual, and the downright silly. Celebrate life—it is a gift from God! 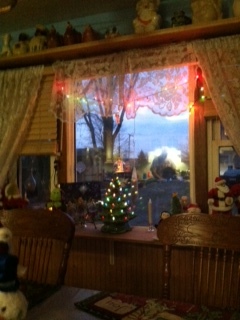 For the past several years, we’ve cleared off our enclosed porch and filled it with Christmas cheer! And Christmas trees–lots of them! It’s just for fun and just for us–no grandbabies around to enjoy it. When I started experience side effects from my second (and hopefully last) brain tumor treatment much earlier than expected, we decided to forego the Christmas Porch this year. Too much work and I didn’t feel well enough to help. But I know my husband……we not only have our Christmas Porch up but we have TWELVE Christmas trees this year. We only had ten, but when I said I’d like to have the twelve days of CHRISTMAS trees, my hubby made it happen! So between now and Christmas, I’m going to share the twelve days of Christmas trees. 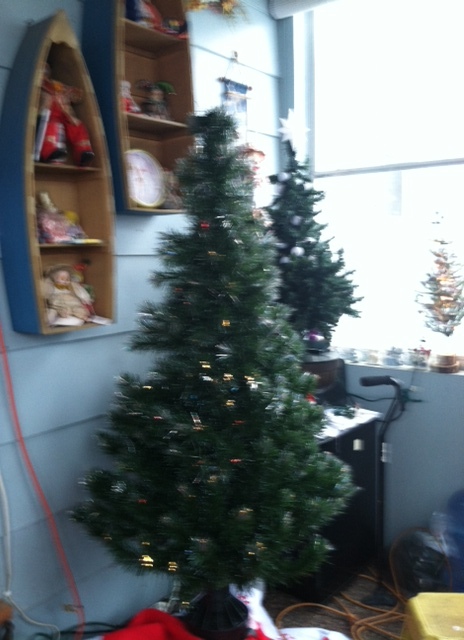 Each day, I’ll post a picture of that day’s Christmas tree. Hope you enjoy them and remember no matter what circumstances you find yourself in–celebrate life! It is truly a gift! At this time of the year, we have so much to celebrate–the birth of a babe in a lowly manger. A birth that changed the world! So, come celebrate with me as we celebrate the birth of Jesus.